Good news! You can now find pattern instructions, backs of patterns and pattern coversall in one place! Henri is proudly wearing his first Halloween costume! As I mentioned in a previous post, I slightly modified pattern 2318 for the Bathat and made Batsocks using pattern 2448. Then, I made a Batdiaper (pocket diaper without the inserts) with the upcoming diaper. Henri wears it over Battights made of swimsuit lining fabric. I did not use any pattern for the shirt and tights (Henri's grandmother can actually cut such basic items without any measurements - Lucky me!). Finally, I used fusible interfacing to apply the batman logo cutouts to the garments. I don't know if Henri felt like a superhero with his costume, but he rolled over, from his tummy to his back, for the first time during the photo shoot!!! I put the Halloween costume project on hold and decided to use pattern 2318 (since it was already open) to make a last-minute gift for a friend of mine who just had a baby. 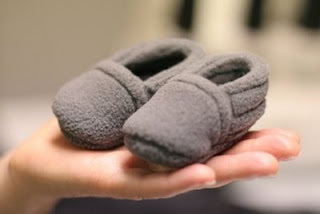 I made little fleece slippers in the smallest size (which is already wayyy too small for 3-month old Henri!). I'm quite happy with the result! 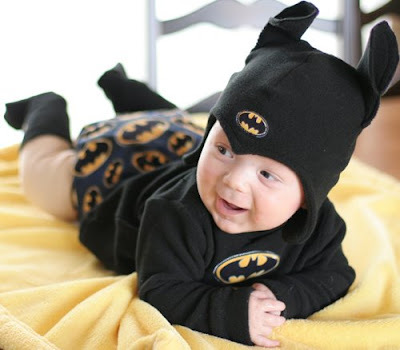 I bought some Batman PUL (laminate fabric we use to make diapers) from Kids in the Garden a few weeks ago that I could use to make a batman diaper. 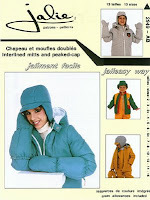 For the hat, I will try making something cute using pattern 2318 since it includes baby sizes. I will modify the hat on the right to make it pointy in the middle... I hope it will work! 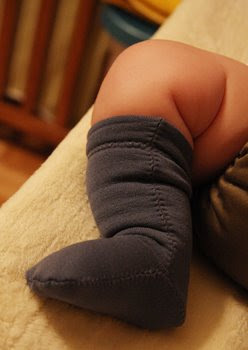 It's getting chilly in Quebec... Henri is keeping his feet (and cute chubby legs) warm with his new Power Stretch socks (pattern 2448).